Now that I have emigrated to the Netherlands and am thinking seriously about adopting Dutch nationality, I start to wonder how many years I spent in Poland. I'm 46 now, I have been in France one year, and some four years in Portugal, and there were various travels in between. So I must have spent some forty years of my life in Poland. I have seen a great deal of the country, traveling for children's camps in my childhood, and for conferences and academic events as an adult. Relatively few pleasure excursions on my own; usually I was too busy. But I went to Bieszczady once to ride horses, and there have also been three or four travels with my foreign husband, who took a great love of the country; unfortunately, as I was afraid, without being loved by my country in return. Right now, I'm getting ready to go to Poland again; I have academic duties in Poznań. And I think about spending a few days circling through the country, to see some of the places I have overlooked, making a few sentimental journeys to significant places where I have already been. As the things are in the country, with the risk of undemocratic transition and falling out of the European Union, I have the unpleasant sensation that any travel to Poland may be my last. I try to face my situation aesthetically; certainly, it gives a special taste and value to any time I will be able to spend in the country from now on. I have been keen to revisit the places of my childhood since a long time, recuperating the travels I have done. At various moments of my life I tried to establish their exact chronology, but I was losing my track over and over again. I suppose the first significant travels of my life brought me northwards, to the region of Masuria, where a sister of my mother lived, with his red-haired husband and five red-haired children, in a farmhouse abandoned by its German owners after the WW2; two or three rooms of the vast manor were still habitable, and that was where they stayed, caring little for the rest, that was slowly falling into ruin. As far as I can remember (I was perhaps 8 years old, or less, at the time), there were two travels to the same place, one in summer and one in winter. From the winter one, I have very few, yet uncanny and beautiful recollections. Firstly, that of a long travel by train, with strange stations where we needed to wait for other trains; lonely, dilapidated stations and trains haunted me in my dreams for many years to come. Secondly, a ride in a German-heritage sledge, for which my uncle borrowed a horse of his neighbor (he had no horse of his own, those people were extremely poor; for some time, my mother was sending them all the old clothes we could spare; later on, I think, she fell apart with her sister). And finally, the most cherished recollection of all, an uncanny walk through a frozen lake, its mysterious, dark green depth to be seen under the ice. The summer trip left lighter, more neutral memories of bathing in the lake and exploring the countryside, its graveyards and gardens overgrown with weeds, as well as other post-German ("poniemieckie", such was the adjective in use at the time) remnants. I remember having found a couple of fossil belemnites, that, according to my father's explanation, were traces of thunderbolts hitting the ground. There were several other travels with the objective of visiting my aunts; my mother had ten sisters and two brothers (one of them rejected by the family, possibly on the ground of his alcoholism; but I am by no means sure of it). On multiple occasions, we traveled to Obsza, a village in eastern Poland, beyond Biłgoraj, where my mother was born. But there was another aunt in Tomaszów Lubelski, on the road to Lviv, and another in Upper Silesia, and another in Greater Poland; for the rest, I am not really sure about their geographic distribution. As I became a teenager, those visits were became very annoying for me; I was exposed to sexist and otherwise unpleasant jokes, as well as other sorts of untoward behavior even in such familiar contexts; the customs of the time and social class were rude. I also had to accompany my grandparents on the few journeys they had in their life. I went on a pilgrimage to Częstochowa with my grandmother, and later on, I accompanied my grandfather on his sentimental journey to Greater Poland, to the village where he was born. They were hardly in their fifties at the time, but they lived such a marginalized life, facing such a narrow range of social interactions that they drew great comfort from the presence of someone younger and more versatile, even if I was only a girl in my early teens. Neither of these trips meant a great fun for me; I distinctly remember the singular, highly unpleasant tension intimidating me in Częstochowa sanctuary, at the moment of uncovering the depiction of Our Lady, in reality a Byzantine icon, that has been held for holy and miraculous by the Poles. When the cover or a sort of metallic curtain was moved up, we were on our knees, heads bent down very low, hardly daring as much as a glance upon the painting. I have always felt similar discomfort in any of those national sanctuaries, Częstochowa as much as Wawel cathedral, such holy spaces that, as I felt, my humble presence there was barely tolerated. I was unable to find any sort of spiritual comfort, sensation of belonging, or anything positive at all in such places. As a child, I had my small share in the religious fervor of the adults, but such feelings disappeared from my life shortly after my first communion. I became a scholar paying considerable attention to religious phenomena, and quite an erudite in the matters pertaining to Christianity, but Catholicism became for me the religion of other people; I think that theatrical moment of the silver curtain moving up, on Jasna Góra, bending us lower to the ground with every millimeter of its ascension, contributed for this trajectory in my life. In spite of scarce means in our possession at the time, people in Poland were very keen to travel, dreamed about traveling, were jealous of those who could travel; especially women. Buses and trains we had were quite gruesome and uncomfortable, but the travel was in our blood. It explains why a family of very modest people like my own could be so evenly distributed in a range of about 600 km (at the time, the distance was greater than it seems today, as it corresponded to interminable journeys). Our travels were what I say: pilgrimages, visits to family members; typical tourism was basically unavailable for us. We went for a two-week holiday only once, to Ustronie Morskie very far in the north, in Pomerania; with such a result that my family's economy broke down completely. When we returned, there was not enough money to buy any food to eat; we had no reserves, no savings; little wonder that my mother did not want to repeat the experience. In two consecutive summers, she took the job of an educator in a children's camp, so we could go all together, also my father and me, to Oblasy near Janowiec, villages on the Vistula river forming roughly a triangle spreading between Lublin and Warsaw. Janowiec has ruins of a Renaissance castle, towering on a hill over a little affluent of the Vistula river; once I took there my father; it was one of scarcely two or three excursions we had together when I was an adult. I had money at the time; but my mother was not in a state to put up with such things. It is a pity; it could have been otherwise. Why didn't we go at least to Slovakia or Croatia? Many modest people did this in 2000s and 2010s; such travels became very affordable. But my parents were mentally not in the state to face such challenges; I tried to take them to the mountains, to Kazimierz Dolny, to the old castles on the river; that was all what I could do. They lived in a very small world, and it was too late to take them out of it. 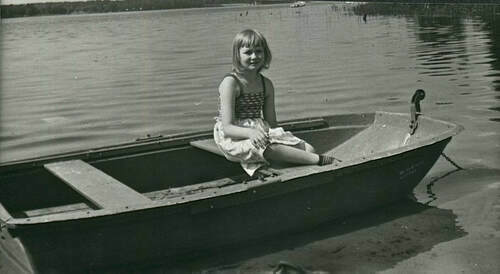 I learned how to travel on my own early in my childhood, with children's camps that were common in the communist Poland; unfortunately, my parents did not have such an experience in their time, and material scarcity made that the few travels they had proved to be rather traumatic than relaxing experiences. I also experienced a great stress in traveling early in my life, as if my presence in the world was unwelcome; for some years, as a teenager, I became very unwilling to travel, even to participate in an excursion organized at school. Be that as it may, the journey seems to have chosen me, even if at some moments I might have been reluctant to choose it. It was, in a way, a point of honor for my mother to send me to children's camp every year; she was very proud of this; perhaps she treated it as a sort of compensation of the fact that she was unable to travel by herself. Those camps were materially as poor as everything in the communist Poland. We were sleeping by ten or twelve girls in an army tent or in a classroom of a local school, transformed into a dormitory for the summer. The water under the shower was often cold and the food was what it could be at the time. The days were similar to each other, ruled by a strict, sort of paramilitary schedule: there were gymnastics early in the morning, and an assembly on an empty square, where we had to form two lines around a national flag. For the rest, a limited opportunity of bathing in a lake was the main attraction. I was bitterly missing my parents and occasionally had to support the cruelty of other children, but certainly, when a new summer was coming, I was both reluctant and eager to have those vacations again. This is how I went to various locations, such as, in eastern Poland, Krasnobród and Okuninka on the Lake Białe, a luxurious resort for the time. It would also be untrue to claim that I only had that sort of communist-style luxury. One summer I went to Świerklaniec in Silesia, where we were lodged in a former aristocratic palace surrounded by an enormous park full of rare, exotic trees. As I check it now on Wikipedia, that must have been the German Schloss Neudeck, formerly belonging to the Henckel von Donnersmarck noble family. I was interested in bird watching at the time; an atlas of birds of Europe, with numerous plates printed in color, was the first book I ever bought and the first luxury item I ever possessed. But I am surprised how few were the bird species I recall to have seen. I am under the impression that even the national wildlife became easier to obtain after the end of the communism; perhaps because people became more respectful, more predictable, less aggressive, less inclined to throw stones; wild beasts must feel that sort of things. Be as it may, naturalist photography was one of the big aspirations of the late seventies in Poland; it was even officially advertised as a modern equivalent of hunting, inheriting all the social prestige associated with such activities. The fact it was so popular, or rather so vastly desired, was undoubtedly connected with a general growth of material aspirations, as well as a thirst for distinction and prestige torturing such a supposedly egalitarian society as ours. But of course I had no means to do such things; I could only participate in the admiration for those who could. I received a primitive camera as a child, even had two or three of them before the advent of the digital, but there was not enough money to buy expensive plates, or films, and to reveal the photos later on. The early travels of my childhood, as I have suggested, were spent close to nature, as poor as nature (even nature!) could be in a communist country. My people were very simple, had very few cultural or educational aspirations. This, of course, was soon to change as I got my own interest in museums, galleries, old castles, history. But since the beginning, I am afraid, my cultural interests were detached from national topics. As I tried to explain more at length in The Four Riders, my main autobiographical essay, the erudition I was keen to gather focused on distant regions and cultures, not the national one, not the one that was taught at school. It was an escape, not a way of participating in the sphere other people shared. This is why I might have been less attentive than required in my early travels through Poland. What is more, history and heritage were coming to me slice by slice, patch by patch, initially unconnected, making no narration I might adopt as my own. I visited spare castles, in Malbork, in Szydłowiec; spare palaces, like in Łańcut, with a museum of coaches evoking lifestyles that were so completely alien to me; spare ethnographic museums, that might come closer to what was effectively my own social and cultural origin, but left me equally unconcerned; spare churches, a lot of spare Catholic churches; and spare Orthodox ones. In my early years, those travels and excursions throughout my country left me with a sensation of perplexity and, as I said, of being vaguely unwelcome in the world. Those places where I was spending my vacations belonged, in a way or another, to someone else: the German families that had fled the Red Army in 1945, the dispossessed Polish aristocracy, the Catholic Church that I perceived as intimidating. The cultural messages I received both at school and from my family failed to create a link between me and whatever might be called the country's heritage. I spent my early childhood in a void, in a total absence of human, historical or religious awareness, playing among the gravestones, hardly visible among the grass, of the Jewish kirkut in Lublin. Perhaps it is only now, from my Dutch exile, that I finally make sense of Poland, as I have already made sense of Portugal, Morocco, Guinea-Bissau, Saudi Arabia and a couple of other regions in the world. As I grew older, I started to travel on my own. As a teenager, I was punk, and I had a couple of very Bohemian journeys in search of rock concerts and festivals. I hardly had money to buy any food and a train ticket, and I simply slept in train stations or staircases of blocks of flats. Later on, when I was a student of an art school, I had painting sessions in locations regarded as picturesque; usually it was Kazimierz Dolny, an "artistic" little town on the Vistula river that already in the late communist period had several "houses of creative work" and, immediately after 1989, became fashionable resort with galleries selling all kinds of artifacts, such as paintings, wood sculpture, ceramics, jewelry and even "artistic" clothing. I started to visit museums with more attention and sometimes went to Warsaw for important expositions. The gravestones of the kirkut of Lublin were raised from the ground and progressively, we became aware of our country multicultural heritage. Across the 1990s, Poland progressively took on a renovated aspect. Trains and roads improved. Finally, quite a new lease of my journeys through Poland appeared at the beginning of my academic career, when I started to travel for conferences and workshops. Places like Częstochowa gained a different inscription in my imaginary geography; in those years the sanctuary lost a great part of its popularity and ceased to be the scene of such a frenetic religiosity as that of my grandmother on her knees and in tears at the moment of removing the curtain hiding the prodigious icon of Our Lady. Now the Church worked on the creation of a university college, and I went there twice for conferences dedicated to translation studies. The University of Silesia, on the other hand, traditionally organized conferences in Ustroń, a beautiful mountain resort where I was delighted to find a small center for the conservation of birds of prey. Katowice gained a thrilling post-modern museum in the former coal mine. I also had many occasions to travel to Wrocław, a dream place of my childhood, immortalized in the TV series "With a camera, among the animals" ("Z kamerą wśród zwierząt"), that was a sort of East-European version of the early programs of David Attenborough. Now I could finally visit its zoo, certainly less glorious than I imagined it as a child. The city center, on the contrary, grew far beyond its former state, profiting fully from its scenic location on the Oder, with several islands connected by bridges. Poznań was in many ways similar to Wrocław in its character. These two universities, making a decent league right after the two leading institutions of the country (the Jagiellonian and the University of Warsaw), were a frequent destination of my visits. But I also went to academically less important, but quite pleasant places in western Poland, such as Opole and Kamień Sląski. Later on, there was also a conference dedicated to African studies in Żory, another location in Silesia. In the early years of our belonging to the European Union, such places of mixed, Polish-German identity quickly gained a new lease of life. Finally, in my late thirties, I started to have something similar to normal vacations. For a period in my life at least; perhaps the normalcy was not attractive enough to make me persevere. Be that as it may, I spent some weekends in Zakopane and, much better than the crowded Zakopane, in Szczawnica, where I was close to Sromowce, the starting place of the famous Dunajec River Gorge rafting. I loved Pieniny Mountains. Closer from Kraków, I also went quite often to the picturesque Prądnik River valley where I used to walk over large distances, descend to caves, and consume grilled trouts freshly caught in the ponds adjacent to a tiny restaurant in Ojców. Especially in May, when the slopes were covered by lilacs in blossom. Farther up the valley, there was the castle in Pieskowa Skała, with its small, but very interesting, somehow cosy museum. Such simple pleasures were mine when I adopted the middle-class lifestyle becoming to an assistant professor of the Jagiellonian University. I said those things kept me satisfied only for a time, because I am not born to be either normal or middle-class. Soon I started to travel abroad more often than in Poland, and for any time I had to stay in my country, I got more or less extravagant hobbies, such as falconry and horse riding. Not to mention a foreign husband, with whom I shared further, otherwise not so very extreme adventures in Poland. I am not a very skillful or advanced rider, just enough, anyway, to enjoy a ride through mountains paths in the forest; at least till the moment when I fell down from the galloping horse in quite a dangerous way, although I was lucky enough to get only superficially hurt. Be that as it may, I went to Bieszczady with the sole objective of riding horses for a week or two. But when we traveled together, my husband and I, we were choosing quieter activities, such as navigating, in a canoe, through the overflowing Biebrza river in the spring or contemplating the region from a balloon. Although international tourism was no longer unknown in that once isolated region, a mixed couple like us still drew some attention. We amused ourselves telling the intrusive people that my husband was an Egyptian I brought from my vacation in Sharm el Sheikh, and that his name was Boobie (just like one male prostitute specialized in Polish women whose story became famous at the time in Polish newspapers and internet forums). Still in his late thirties, he was handsome with his tribal, thoroughbred look; people might have thought that he was somehow too attractive for an average woman like me. Nonetheless, we were in love and very happy in that swampy region, spotting moose, woodpeckers and cranes as we wandered through marsh forests. We went to Szczawnica, and to Zakopane, and to Ojców, and to Kazimierz Dolny, and to all those usual places in Poland, climbed Tatra and Pieniny mountains, and of course he had the rifting through Dunajec Gorge. Blasphemously, we even made the circuit of Kalwaria Zebrzydowska, a sort of Baroque symbolic geography mimicking Jerusalem and the Holly Land in the middle of the scenic landscape of Lesser Poland, and took an ice-cream flavored with Damascene rose essence, advertised as "Crusader's Delight", in the Benedictine abbey of Tyniec (later on, those politically incorrect names of the dishes disappeared from the menu; probably because the average Catholic pilgrims visiting the place found them bizarre and quite unappetizing). These are days that shall not return, leaving nothing but a recollection of a country in blossom that is no more. Only a few years ago, the Benedictine abbey in Tyniec was a secularized place dedicated to commercial exploitation and cultural heritage, just as any Benedictine abbey in France; it had a small exposition with some medieval items and a multimedia presentation, and a small bookshops where I used to spend hundreds of złotys on CDs with medieval music and scholarly editions of early Christian authors. Together with my husband, we were cultured pilgrims to one of the cradles of civilization, as we would be anywhere else across Europe. In recent years, not a single stone has been moved in the abbey; the exposition, the bookshop, the restaurant, the shop with Benedictine honey and beer are still there; but for some impalpable reason, I am not the hero to cross its gate, dragging a swarthy infidel behind me; there is no "Crusader's Delight" to be eaten any more; anyway, the name has ceased to be funny; the history, perhaps, has ceased to be mere history. Jasna Góra recovered its place in Polish history, this time as the destination of extreme-right rallies in which young men performed the characteristic greeting, stretching their right hands. I felt again unwelcome in this world. In a country that has never been truly my own.